The new Black Shark 2 recently launched, giving mobile gamers another smartphone option to game on the go, and one design decision we found intriguing was the lack of a headphone jack – but Black Shark already plans to change that on its next phone. 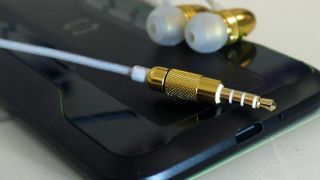 In a statement to TechRadar, a spokesperson for Black Shark justified dropping the jack by saying, "high-end flagship mobile phones have cancelled 3.5 headphone jacks a few years ago as it is not in line with the development trend of mobile phones." Black Shark's statement that a headphone port is "not in line with the development trend of mobile phones" is curious given that recent high-end phones like the Huawei P30 retain the feature, and a gaming smartphone would benefit from the ability to have a gaming headset connected. Is the Samsung Galaxy Note 9 one of the best smartphones for gaming? There is a USB-C to 3.5mm jack converter included with the Black Shark 2, but you can't use this to charge your phone or listen to music at the same time as gaming with the Game Pad peripherals, which limits its usefulness. The statement continued, "this was a design decision made in conjunction with initial feedback from our audience however after communicating and discussing with gamers further, we realized the importance of the 3.5 headphones for the gamers’ user experience. "We will have 3.5 headphones jack in our future products." TechRadar previously received a statement from Black Shark which said the lack of a headphone port was made up for by the phone's dual front-facing speakers and three noise-cancelling headphones. This quick reversal may show Black Shark doesn't have a set design vision for the future of its phones, which could be a good or bad trait depending on how you look at it. It could suggest Black Shark's future plans are subject to change. It may be a positive thing as the company is open to change depending on the needs of its consumers. The Black Shark 2 is so new that we haven't had time enough to write our full review (although you can check out our hands-on Black Shark 2 review), so a potential Black Shark 3 with headphone jack is still a long way away, but we're intrigued to see how Black Shark adapts to consumer feedback from its previous devices.